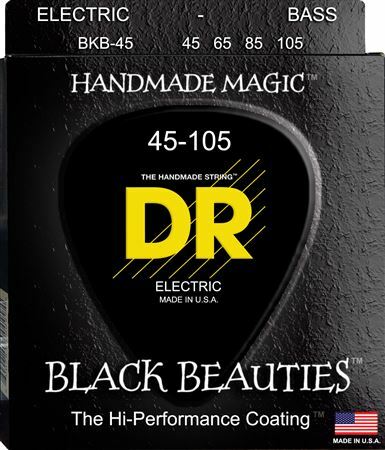 Shop DR Strings BKB45 Black Beauties Coated Bass Strings Medium 45-105 from AMS with 0% Interest Payment Plans and Free Shipping. These coated black bass strings are on a round core, and come in a 4-string set. The DR K3 Black Beauties aren't just coated to look great, although that helps, the coating process improves the performance of these strings and makes them more corrosion resistant. Had used fat, flatwounds for the Jamerson tone but the Thomastix strings were not clear in the mix with other guitars and I could not correct it with eq or technique. The DR strings were a big improvement and ring clear even while muting. I like them. Hard to give longevity review since I just put them on but seem to be great new! Great strings, and a great price. They sound fantastic, and are easy on the fingers. These look and sound good on my black bass. These are the only strings I use. Best strings I ever had! I will only use Black Beauties from now on! Great feel ,like silk ,fat round thump, last for ever ,a win win ! I love them, a lot of people don't like coated strings because it dose something to the sound that's not good especially if you play metal or hard rock but i think sound just as good or better than other non coated strings. This is my 2nt set and i will buy more. If you own more than one bass you buy these. Great strings.But much different than the feel and sound of most strings.Put them on a second bass for a variation and you wont have to change them for a year. Takes some getting used too.Then you appreciate the smooth sound and how it forces you to change your playing. Some would say muted.I think smooth.